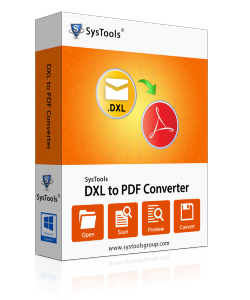 When customers launch the DXL to PDF converter on their machine, the tool itself fetches all the system folders and drives from PC. The extracted data items get loaded on the left-hand panel of software screen where one just needs to navigate towards the panel and click on the folder, which comprises of DXL files. The DXL file to PDF converter facilitates its users to view Domino emails before proceeding with the conversion. Users will be able to view all the technical properties of an email message along with attachments in the same extension as they were at the time of mailing. A user can transfer all or selected Domino XML files in PDF format. Once emails get loaded on the preview wizard of Lotus DXL to PDF Migrator tool, users can check the desired emails/folder and then, export them to the desired location in PDF format. The tool supports .dxl file from any version of Domino Server and it is compatible with Windows OS 10 & below versions. You can save DXL email files into PDF with an option to choose desired naming option. The software by default saves output PDF file with the Subject line of the email. But there are other several options like Date (DD-MM-YYYY), From + Subject + Date (YYYY-MM-DD) etc. You can also save DXL emails with MD5 of email or in Auto incremental format. DXL to PDF Converter allows you to switch the screen view mode. You can change the view mode of the screen from horizontal to vertical or vice versa. It is possible to change the view mode of the screen from vertical to horizontal or vice versa. By default, the mode remains horizontal but you can change to vertical whenever required. The term DXL stands for Domino XML Language, which is a file extension used for determining the information involved in Lotus Domino database and its structure. The file gives description of IBM Domino-based designs and components like forms, document, and views. Using a DXL file is an amazing means to expose the Domino programs data on any other platform. It has permitted users to export and import both data as well as designs components from the Domino server in an XML format. What Arises Need for DXL Emails to PDF Migration? Well, it is not possible for a person to have the Domino server/IBM Notes email program all the time. Therefore, a solution to convert to PDF is required by which users can save their emails of DXL file in PDF file format. This conversion is needed because it enables users to access their messages on any platform wherever they want, including Android too. As such, there does not exist any solution to print DXL emails in portable documents. Therefore, one searches for a need to have a third-party utility by which they can perform the same task. The FreeViewer team understands the demands of today’s enterprise users and originated a simplified tool for Lotus Notes .dxl file to PDF conversion. Explain the brief functioning of the tool? Step 1: Install the software and open it. Step 2:The tool will fetch all the files and folders from your system on the left panel of the window. Step 3: Click on the file/folder which consists DXL files. Step 4: You can view the contents of the DXL file on the right panel of the window. Step 5: Select the files you need to convert and click on Export button. Step 6: Apply folder structure settings and select file naming option and browse the destination location. Step 7: Now, the file will convert from DXL to PDF. You can view the files in the destination location. Will your DXL File to PDF Migration software convert emails with their attachments? Yes for sure, you will be able to export DXL emails to PDF with attachments. Moreover, you do not have to worry about any data loss because we accomplish conversion in a way that not even a single bit data is modified in resultant documents. Is there any file size limitation imposed in your DXL to PDF converter tool? No, there is no such limitation in our software. You can browse source DXL file of any size with help of this application. What are all supportive computer programs needed for working with this FreeViewer utility? There is no need to have any supportive program for the functioning of our tool because it is an independent solution to migrate emails from DXL file to PDF format. Well, you just need to have Adobe Acrobat Reader program to open and view the resultant file on your system. Is there any scope of performing date-based filtering migration with your DXL File to PDF converter software? No, the software allows you to perform selective migration by checking/unchecking messages, which you want/do not want to save in PDF file format. "I was in a depressed state when my team leader asked me to provide him with DXL emails in PDF format as he wants to access them on his phone. I started searching for the same and in one click only I found this product! Sharing my reviews on DXL to PDF converter then, I would like to say that the application is smart enough in working because it is having all those features, which a person requires while performing the .dxl file to .pdf migration." "First of all, I downloaded the trial version of this DXL file to PDF converter. I tested the working of this tool and was so much impressed by it that I purchased the software. Spending dollars on the Domino DXL to Adobe PDF converter proves itself worth through its performance and working. I highly appreciate the hard work of developers who came up with such easy-to-use technology of the DXL to Adobe PDF conversion." "It was really a nice experience working with this tool. It proves above my expectation at the time of DXL to PDF conversion. It was hard to believe that the utility takes a very less time in performing the export process. The tool is recommended to all those users those are facing many issues in converting Domino XML file to PDF format. The tool is worth enough to convert the file formats with so much ease. Thanks a lot for such tool!" "It was impossible for me to access emails from Lotus Notes in DXL format on my mobile phone. I can only access them through my system. But after using this tool, the task becomes so easy and robust. Now, my emails are portable enough to access them in mobile as well as enough capable to send as an attachment in an email to my colleague. What an amazing tool! Thanks for such software!"